Some states, such as Kentucky and, most recently, New Jersey, have taken steps to reform their bail systems. But many others, including Connecticut and New York, still rely on monetary bail to determine who can be released pending trial. 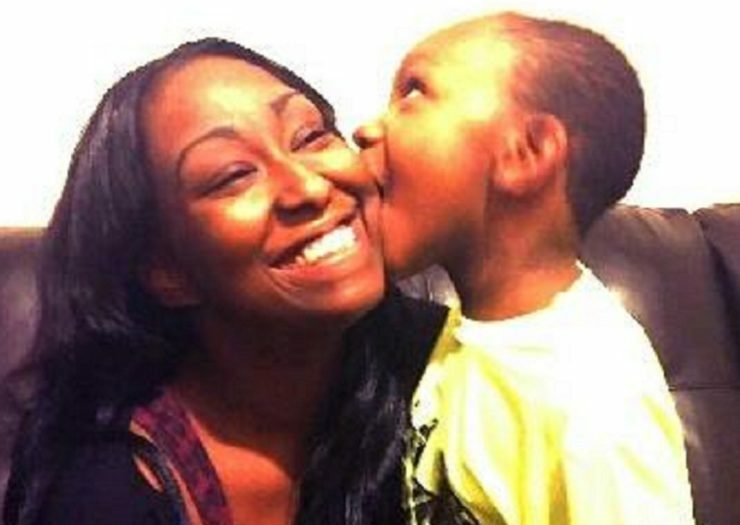 Cherelle Baldwin with her son, Jeffrey. On March 31, Cherelle Baldwin was acquitted of all charges in the death of her abusive ex-boyfriend. That afternoon, she walked out of court a free woman. But at that point, she had had lost nearly three years of her life behind bars, thanks to a $1 million bail that she and her family could not afford. Her son, Jeffrey, was 19 months old when she went to prison; he was 4 and a half when she came home. For nearly three years, she parented through phone calls, letters, and twice-monthly visits. She called him every day except for Tuesdays, when the prison was locked down and no calls were allowed. She mailed him cards and drawings; Baldwin’s mother, Cynthia Long, mailed back the ones that Jeffrey created in day care. Jeffrey usually responded in monosyllables. “He’d answer, ‘Mom,’ ‘yes,’ ‘no,’ ‘I don’t like. '” They would hug and they would cry. “Well, it was mostly me crying,” Baldwin admitted. Baldwin’s story of spending years behind bars while awaiting trial is not exceptional. Across the country, people languish in jails waiting for their day in court. Twelve million arrests are made each year, according to Cherise Fanno Burdeen, the executive director of the Pretrial Justice Institute, which advocates for fairness in the pretrial process. Seventy-five percent of those arrests are for misdemeanors. Among those charged with felonies, 47 percent are assigned bail amounts that they are unable to pay; similar numbers are not accessible for misdemeanors. Across the country, 25 percent of people facing felony charges are ultimately found not guilty or have their charges dismissed, including those who posted bail or were otherwise released pretrial. In most states, people remain in jail awaiting trial, but in those with no women’s jail, such as Connecticut, women like Baldwin are sent to the state prison. Some states, including Connecticut, are attempting to address reforms in the legal system. Still, Baldwin—and others like her across the country—have spent years in jail for crimes they have never been convicted of, simply because they could not afford the price tag attached to freedom. Bail is a monetary amount set by a judge to ensure that a person returns to court if they are released following arrest. The reasoning is that, by paying a certain amount of money, the person is more likely to show up to court; if not, they forfeit that money. But what ends up happening is a two-tiered system, in which those who can afford to pay can go home to await their day in court while those who cannot, like Baldwin, must stay behind bars. According to Connecticut’s own guidelines, if a person cannot afford the bail amount set by police at the time of arrest, they are interviewed by bail staff, a process that can change that amount. Bail staff consider specific factors, known as “weighted release criteria,” when determining whether to decrease (or increase) the amount of bail. Those criteria include the nature and circumstances of the charge, the person’s previous convictions, their past record of court appearances, family ties, and employment record. Although Baldwin was charged with murder, she had no previous arrests or convictions, had extended family ties in the area (including her 19-month-old son, Jeffrey), and a full-time job. She had also voluntarily turned herself in after receiving the arrest warrant in the mail a few weeks after her ex-boyfriend’s death and, from the beginning, had claimed self-defense. Baldwin stated that she was interviewed by bail staff a few hours after turning herself in, but does not recall what was asked. In an email, Deborah Fuller, the director of Family and Juvenile Services of Connecticut’s Court Support Services Division, said that bail staff recommended that Baldwin’s bail be set at $500,000. The court set it at $1 million. Baldwin was taken to York Correctional Institution, the state’s women’s prison that holds women awaiting trial as well as those who have been sentenced. But that million-dollar amount isn’t unusual, according to Mike Lawlor, the Connecticut governor’s undersecretary for criminal justice policy. “The most important thing to keep in mind is that bail is based on the charges you’re facing. One million dollars is not unusual for a murder charge,” he told Rewire. He declined to comment on the specifics about Baldwin’s case. Connecticut also has a Jail Re-interview Program, for people who are incarcerated because of failure to post bail. Jail staff can then change the amount, but the program typically targets those with bail amounts under $100,000. Those with higher amounts can be re-interviewed if the defense attorney requests it. According to Fuller, this was because “at no other time [after the initial interview] was bail staff requested to or participated in a bail hearing.” But Baldwin’s attorney, Miles Gerety, said that he did file a motion and argue in court for a bail reduction after her 2015 mistrial. The judge denied his motion and her bail remained at $1 million. In 2015, the State of Connecticut was one of 20 jurisdictions in the United States awarded a $150,000 grant plus technical support from the MacArthur Foundation’s Safety and Justice Challenge. According to the MacArthur Foundation’s press release, the grant would allow them to “build plans to create more fair and effective local justice systems.” On April 13, 2016, two weeks after Baldwin was fully acquitted and released from prison, the MacArthur Foundation announced that it was awarding Connecticut an additional $2.5 million to implement jail-related reforms, including programs to divert people with mental illness from jails and to help others post bail. But the state’s reforms will focus on people who are facing lower-level charges and are unable to post bail amounts of $20,000 or less. Not everyone agrees that people charged with murder should stay in jail awaiting their day in court. The Pretrial Justice Institute is a technical consultant to the Safety and Justice Challenge. Its executive director, Cherise Fanno Burdeen, said what happened to Baldwin, from the violence she suffered at the hands of her abusive ex to her three years’ incarceration, was “absolutely horrible.” She said that Baldwin’s job, family ties, lack of substance abuse, and young child should have been considered risk-mitigating factors that would assure her appearance in court and lack of threat to public safety. “Where was she going to flee to? She had a 19-month-old child, other family members, and a job,” she pointed out. In recent years, there has been movement to abolish the practice of monetary bail, due in part to high-profile cases like that of Kalief Browder, a 16-year-old from New York City who was sent to Rikers Island, the city’s island jail complex where 85 percent of the 10,000 people incarcerated are awaiting trial. Browder was charged with stealing a backpack; a judge set bail at $3,000, an amount that his family could not afford. He spent three years on Rikers Island, where he was assaulted by other teenagers imprisoned on the island as well as jail officers. He also spent nearly two years in solitary confinement, where he was confined to a cell 23 hours a day. In 2013, the district attorney dismissed the charges against him and Browder was released. But his time at Rikers had left an indelible mark: In 2015, he committed suicide. He was 22 years old. New York City announced a plan last year to relax bail requirements for “some low-level offenders.” And Washington, D.C., has abolished the practice of monetary bail altogether; about 85 percent of people are released while they await trial. Had Baldwin been arrested in D.C., the pretrial process would have been very different. “The prosecutor would move for detention based on the seriousness of the charge,” Burdeen explained. That action would trigger a preventive detention hearing, which would occur within three days. During that hearing, Burdeen noted, the prosecutor must “show that there’s enough evidence to show that a crime was committed, that she most likely did it, and that no condition would protect public safety and ensure that she shows up to court other than detention.” In addition, the prosecutor would have to substantiate why he or she felt detention was appropriate. Meanwhile, defense attorneys would present risk-mitigating factors, such as her job, her role as caregiver, her other family ties, and her lack of substance abuse. The defense could also present conditions that Baldwin was willing to undergo, such as wearing an electronic monitor or abiding by a curfew, if she were released pending trial. “The judge then makes an on-the-record decision,” Burdeen explained, which can be appealed. Jails have 11 million admissions each year. There’s a lot still unknown about those who stay there, however. For instance, there is no aggregate data showing how many people sitting in jail across the country for failure to post bail are parents or primary caregivers. Similarly, there is no record of how many are domestic violence survivors whose charges stem from defending themselves. What is known is that, in 2014, 109,100 women (or 106 for every 100,000 women in the country) were sent to jail. What’s also known is the racial disparity of those behind bars. In 2014, although Black people comprised 13 percent of the country’s population, they made up 35 percent of the country’s jail population. Jeffrey will turn 5 in October. Baldwin missed three years of growth milestones in her son’s life. “I missed him being potty-trained,” she said. “The first day of [day care]. His second, third, and fourth birthdays.” When she spoke with Rewire, she was still getting used to parenting a boy who is no longer a baby. “When he’s in the bathtub, I panic because I’m afraid he’ll drown,” she said. But Jeffrey no longer wants his mother washing him or even staying in the room while he bathes. Baldwin even misses changing diapers.